We’re here at Samsung’s SSD Global Summit, the company’s annual SSD technology reveal. This event is typically held mid-summer, however with MERS concerns in South Korea this year, the company held off on the event until now. 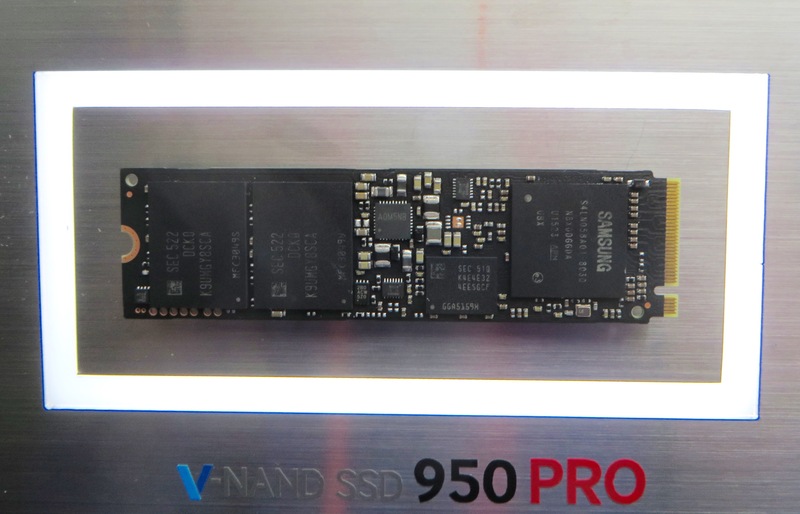 To jump right into matters then, the centerpiece of Samsung’s consumer announcements today is the 950 Pro SSD, the latest iteration of the company’s flagship consumer SSD. The 950 Pro comes at an interesting time for Samsung and the industry as a whole, as we’re in the midst of many transitions: SATA to PCIe, AHCI to NVMe, and planar NAND to 3D/V-NAND. Consequently for Samsung, they are going all-in on all of those major transitions at once with the 950 Pro. So let’s start with the base specifications. The 950 Pro marks Samsung’s transition from SATA to PCIe for their flagship consumer drive, and in doing so shifting the primary form factor from 2.5” to M.2. As a result the 950 Pro comes as a M.2 2280 drive, what is quickly becoming the common size for “full size” laptop SSDs. 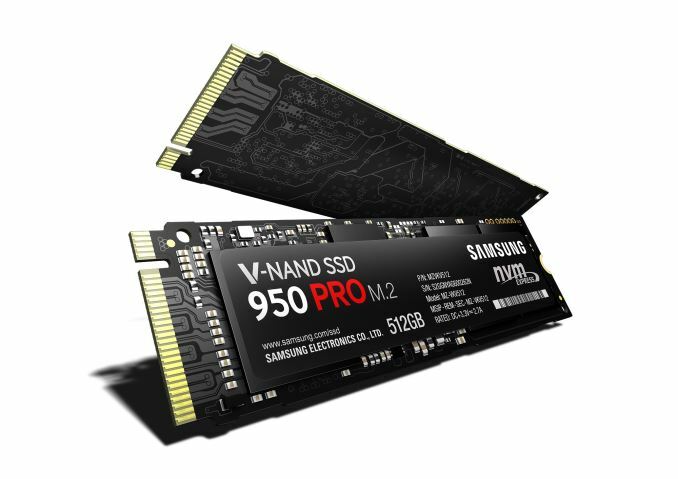 The 950 Pro is in turn the first SSD shipping from Samsung that combines the company’s V-NAND technology with NVMe protocol support. Until now Samsung has offered V-NAND based drives using AHCI, such as the current 850 Pro. Alternatively Samsung offers NVMe drives to OEMs in the form of the SM951-NVMe, however this drive is built with planar NAND. And in the interim Samsung has announced the enterprise-level PM953, a drive which combines TLC V-NAND with NVMe, however as we still don’t have a release date for that drive it looks like the 950 Pro will be the first such drive to actually ship out of Samsung’s entire product lineup, never mind the consumer lineup. The release of a V-NAND plus NVMe drive has been a long time coming, and should confer both performance and cost improvements. As we’ve seen with the NVMe SM951, just the switch to NVMe with planar NAND has greatly improved small I/O latency while also improving overall I/O consistency. V-NAND in turn further improves Samsung’s ability to scale up NAND density, and by extension bring down costs for any given capacity. The die size difference between Samsung’s 32-layer V-NAND and the smallest planar nodes is not overwhelming, but it will still help to push the envelope on price vs. capacity versus their current M.2 planar drives. But compared to the 850 Pro in particular, we’re also seeing a shift from SATA to PCIe, which will significantly boost performance in this product segment. Samsung is using a PCIe x4 connection here, which gives upwards of 4GB/sec of bus bandwidth; Samsung’s official ratings are up to 2.5GB/sec reads, but this is still a large jump compared to the 600MB/sec limit imposed by SATA. Between the bandwidth improvements from PCIe and the I/O improvements from running NVMe over PCIe, Samsung should see significant gains in both sequential read/write performance and in small I/O client workloads. Curiously, Samsung is only using their second-generation 32-layer V-NAND in these products. The company’s recently announced third-generation 48-layer V-NAND is not being used here, and so far Samsung has not announced any products that will be using it beyond the enterprise-level PM1633a, a high capacity drive for read-heavy workloads. Consequently this means Samsung is using their 128Gbit 32-layer MLC V-NAND in the 950 Pro. This is the same generation V-NAND that is in last year’s 1TB and below 850 Pro, however the capacity is up from 86Gbit. I expect the use of denser NAND will have some kind of performance impact, but relative to the 850 Pro here the big change is really the interface, the controller, and the form factor. The use of M.2 for the 950 Pro will impose capacity limits on the drive due to the smaller size of the M.2 form factor compared to 2.5” SSDs. This means that the 950 Pro will come in 256GB and 512GB capacities. Next year Samsung will be releasing a 1TB version of the drive based on 48-layer third-generation V-NAND once that tech is ready and plentiful for consumer drives. Of course with the current capacity limit of 512GB, this is ¼ of where the 850 Pro currently tops out. Consequently we aren’t going to see the 950 Pro completely replace the 850 Pro like prior generations of Samsung’s drives have done. The 850 Pro will continue to sell as a higher capacity option, with a new 4TB drive to come. As for the 950 Pro’s controller, Samsung is using their UBX controller here. This is the same controller that is featured in the existing SM951 OEM drives, making the big difference versus SM951 the use of V-NAND versus planar. Like the SM951, this means Samsung is using 512MB of memory to back the SSD controller, upgrading from LPDDR3 to LPDDR4. In terms of features, the 950 Pro will support 256-bit AES. Perhaps more importantly though the drive will be bringing TCG Opal support for Microsoft’s eDrive standard, allowing the drive to do native encryption for BitLocker. Unfortunately this feature won’t be in the shipping firmware, and will be coming in a future firmware release for the drive. 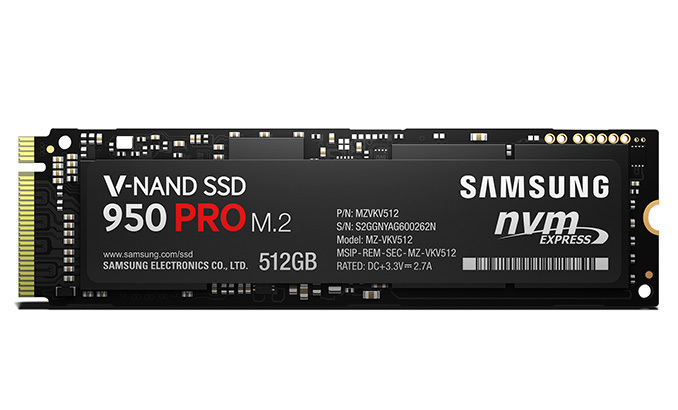 Also of note on the OS front, Samsung will be shipping their NVMe driver with the 950 Pro as they have previously with the SM951. With Windows 8.1 there were some shortcomings with Microsoft’s generic driver, leading to manufacturers like Samsung producing their own driver. We’re still checking with Samsung and others over whether the Windows 10 driver improves on this situation at all, though Samsung has commented that their NVMe driver will work on Windows 10 as well. As for rated speeds, the 512GB drive will be rated for 2.5GB/sec sequential reads and 1.5GB/sec sequential writes, with 12K and 43K read and write IOPS respectively for shallow consumer-style 4K queue depth 1 operations. Power consumption meanwhile is rated for 1.7W at idle, 5.7W average, and 7.0W maximum when bursting. Samsung doesn’t publish similar numbers for the SM951, so it’s not clear at this point how the shift to V-NAND impacts power consumption for Samsung. Meanwhile write endurance ratings are up versus the 850 Pro. Whereas the 850 Pro 512GB was rated for 300TB and the 256GB 850 Pro was rated for 150TB, both 950 Pro models will be seeing a decent increase. The 256GB 950 Pro is rated for 200TB, a 50TB increase, and the 512GB 950 Pro is rated for 400TB, a 100TB increase. This works out to 781 writes over the lifetime of the drive, though in all practicality these drives should well exceed that. However at the same time Samsung has surprisingly cut back on their warranty length. Whereas the 850 Pro drives shipped with a 10 year warranty, the 950 Pro drives are getting a halved 5 year warranty. We’ll be catching up with Samsung later today to try to find out why the warranty period has been reduced. Wrapping things up, Samsung tells us that the new 950 Pro drives will be going on sale in October. The 256GB drive will hit the market with an MSRP of $200, and $350 for the 512GB drive. Compared to the very difficult to find in retail SM951 these prices should be more than competitive, though compared to the current 850 Pro there will be a significant price premium at these MSRPs. That's surprisingly slow - plain dual-channel haswell (nothing cutting edge) ddr3 1600 should be getting around 23GB/s read, write or copy bandwidth. 8GB/s sounds like there's a bottleneck somewhere else (which, with those numbers, wouldn't really surprise me), or that memory is copied 3 times (which also wouldn't really surprise me) in the process of getting to the "disk". What's the point of a RAM Disk anyways? Modern operating systems are pretty smart about caching data in RAM, the RAM Disk will just take away memory from that (Linux tmpfs is a bit smarter about it). Everything you could want from a SSD in 2015. Still, QD1 4k performance will ensure in day-to-day usage these won't perform much better than the current SATA drives.